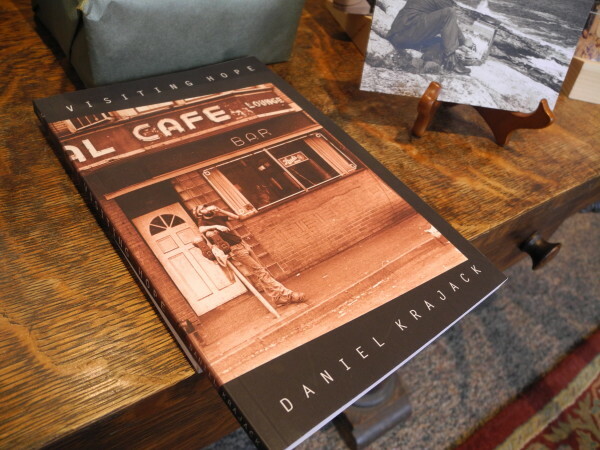 The cover of Daniel Krajack's debut novel, Visiting Hope, features a 1980s-era photograph of the former newspaper copyeditor. Krajack, who is suffering from a progressive neurological disorder, now is bed-ridden and mostly speechless, but the efforts of two friends have resulted in the publication of his book. BELFAST, Maine — A lot of people in Waldo County know Daniel Krajack, who worked as a copy editor for two local weekly newspapers in the 1980s and 1990s and was a waiter at the Belfast Cafe. The last few years have been hard ones for the 67-year-old former wordsmith, who is suffering from a progressive neurological disorder that has left him bedridden and mostly speechless. That’s why publishing and promoting Krajack’s debut novel, “Visiting Hope,” has felt so important to the friends working to make it happen. Krajack wrote the short novel nearly a decade ago, before his health started to deteriorate. Back then, he made about a dozen copies that he put in a binder and gave to friends to read. Davis was one of those friends. He remembers Krajack as a talented wordsmith who was a good athlete and liked to drink and hang out at local bars such as Rollie’s and the now-defunct Bruno’s. Krajack hand-built his stone house in Frankfort, and he was well-liked around town despite — or because — of the way he could be curmudgeonly and get into barroom arguments, Davis said. But as the disorder progressed, Krajack’s world shrunk. He lives at Bayview Manor in Searsport, where he gave a photocopy of the manuscript to caregiver Magdalena Legocki. Legocki and Davis edited “Visiting Hope” and paid to have it published at Maine Authors Publishing in Rockland. Davis described the novel as entertaining, quixotic and at-times surreal. It’s set in Maine, but isn’t a Maine novel “per se,” the editor said, adding that the main character is a nameless man with a friend who is sick and about to die. The publication of the book will be celebrated 4:30-5:30 p.m. Sunday, Nov. 23, at Left Bank Books in Belfast. Krajack will be the guest of honor, if his health will permit him to make the trip.